The Planet Eclipse Gtek 160R is a newer version of the Gtek released in 2015. The Gtek160R has new features on top of the proven gamma core drivetrain from the Gtek that we have come to know and love. The barrel included is a standard 2 piece 14" barrel in .689 bore size. The main changes between the two guns can be seen externally. 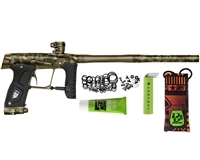 The Gtek 160R features a full aluminum design, whereas the original Gtek is aluminum and composite. The body along with the bolt cap features all new sleeker milling that really gives the 160R an aggressive appearance. The all-aluminum feedneck features a lever lock that features a sprocket screw that can be tightened and loosed by using your fingers instead of requiring you to use an allen key. The SL4 Inline regulator is redesigned to accommodate the all new AT Pipe making the 160R a true hose-less design. The biggest feature difference is the all new OLED board that comes installed from the factory in the new all aluminum frame. Essentially the Gtek 160R is a high end gun at half the cost. It truly performs like one of today's high end tournament markers at a great price point. The ultra low 135psi operating pressure allows the Gtek 160R to consistently shoot at high rates of fire without causing the marker to come off target due to recoil.